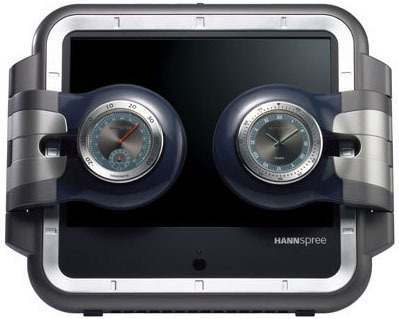 Is Hannspree winding us up with watch TV? Hanspree has launched its latest souped up TV - at least we think it’s a TV. 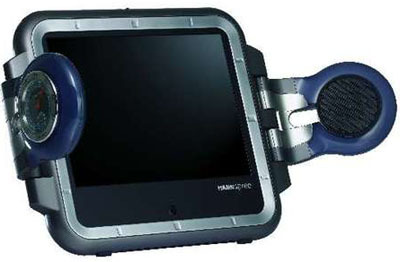 The screen incorporates several unconventional gadgets that can only be a distraction from whatever is being displayed on its 12.1in LCD screen. The HANNStime.square's LCD display has two retractable ‘arms’ on either side, one of which is a sports watch with Swiss-made movements and the other of which is a thermometer come hydrometer, for tracking temperature and humidity while you watch the box. Cunningly, the arms also have 2W speakers embedded behind each measurement gizmo. The display has a maximum resolution of 800 x 600 SVGA and brightness of 450cd/m2, with a contrast ratio of 400:1 and a casing colour option of, oh, just grey. It also has several interfaces, including one VGA and one headphone jack. The connection with Time Square isn’t immediately visible. OK, it's square, and tells the time, but it hasn't got a giant neon Budweiser advert. Whatever, the display is available now for around £400 (€458).